After that anxious wait, the restoration of the Pampanga High School main building, a Gabaldon schoolhouse built in the early 1930s, is finally complete. As always, members of the Heritage Conservation Society trooped to the inauguration and turnover ceremonies. And since this time around, the event was in my own turf, I was the designated driver... hehe! 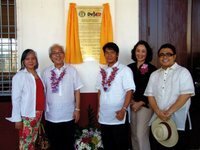 In the group was HCS president Gemma Cruz-Araneta, restoration architects Toti Villalon and Melvin Patawaran, Carmen Prieto of the Dagupan Heritage Foundation and myself. 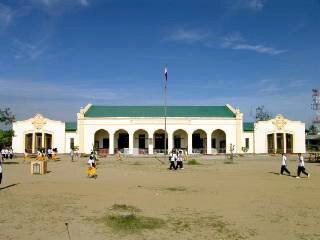 With a current enrollment of 11,000 students, the Pampanga High School is the biggest public high school in Pampanga. Its early roots can be traced back to 1902 when the Americans established the first high school in San Fernando. But due to the lack of students who made it to senior year, students were forced to finish their secondary education elsewhere. So it was not until 1912 that the first class graduated from the Pampanga High School. The restored main building is actually the second one since there was an earlier Gabaldon building completed around 1908 together with the Pampanga Capitol building. 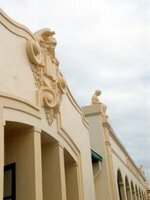 When the current building was completed in 1935, the older structure was reused as an annex. From 1980 up to 1995, it was used by the University of the Philippines Extension Program in San Fernando, Pampanga. What remains of that historic structure today is a result of the merciless looting and pillaging by some public officials. It stands as a harsh reminder of how badly certain leaders value their own heritage. But even the newer Gabaldon almost became a victim of well-meaning but misinformed efforts of certain indiviuals and groups. 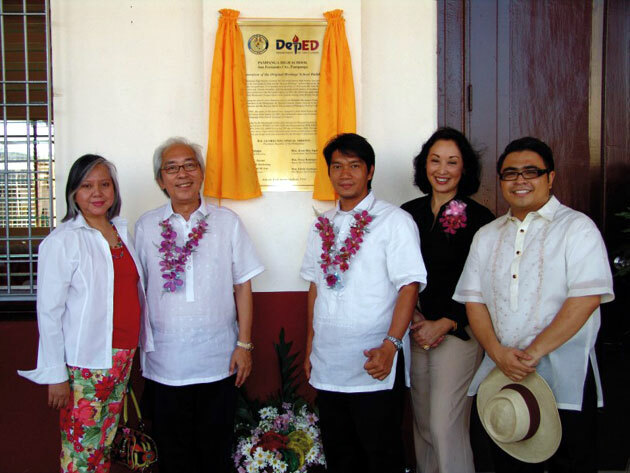 Good thing the Department of Education, through Undersecretary Mike Luz, intervened and saved the structure from a merciless renovation, including it in the DepEd-HCS Heritage Schoolhouse Restoration Program. Today, it stands as a testament to how heritage should and could be conserved. The Pampanga High School itself is a monument to the many leaders it molded, most prominent of which is former president Diosdado P. Macapagal of the Class of 1929. As a young kid, I was already familiarized to this outstanding group since my grandfather, Mariano D. Santos, his sister Felicidad, and their first cousin renowned pre-war journalist Amando G. Dayrit, were all members of the Class of 1929. And my lolo always beamed with pride when he showed us photos of himself together with the former president. A sampling of PHS' prominent graduates can be found here. After the program, the group proceeded to Betis and Bacolor to visit their heritage churches. And our visitors were not disappointed. PHS photos courtesy of Arch. Melvin Patawaran.